Why must critics unmask and demystify literary works? Why do they believe that language is always withholding some truth, that the critic’s task is to reveal the unsaid or repressed? In this book, Rita Felski examines critique, the dominant form of interpretation in literary studies, and situates it as but one method among many, a method with strong allure—but also definite limits. 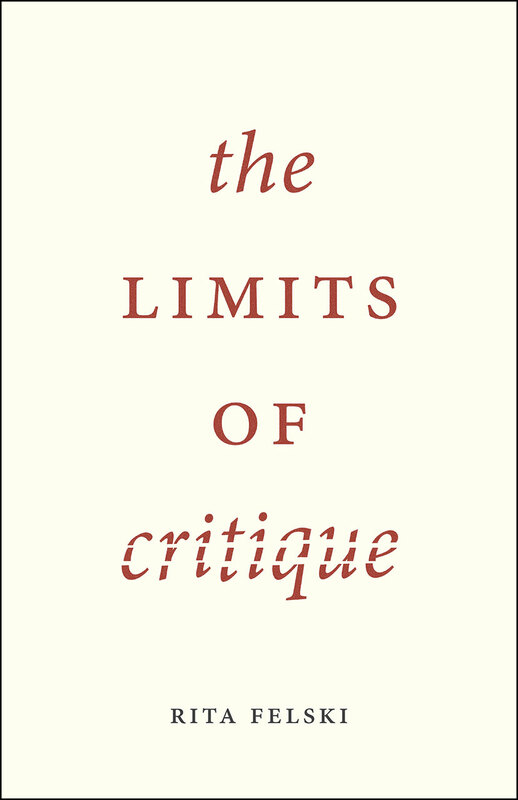 Felski argues that critique is a sensibility best captured by Paul Ricoeur’s phrase “the hermeneutics of suspicion.” She shows how this suspicion toward texts forecloses many potential readings while providing no guarantee of rigorous or radical thought. Instead, she suggests, literary scholars should try what she calls “postcritical reading”: rather than looking behind a text for hidden causes and motives, literary scholars should place themselves in front of it and reflect on what it suggests and makes possible. By bringing critique down to earth and exploring new modes of interpretation, The Limits of Critique offers a fresh approach to the relationship between artistic works and the social world. "I sense that Felski wants us to dispense with the mood of mysterious purposiveness taken with literary works and with the influence machine apparatus and its moral psychology. Therein lies the book’s greatest and most ambitious provocation: its claim that aesthetic works have nothing to hide and that there is no ghost in the machine. By admitting of this fact we may reacquire the pleasures of criticism." "Felski suggests that authors, readers and critics are not the only actors involved in interpretation, there are non-humans, texts, journals, circulation systems, but moreover there are hermeneutics, theories and other techniques, including critique. Within this complex network, critique has its limitations, and there are numerous post-critical possibilities."